To order from the publisher call 1-800-FBA-BOOK. 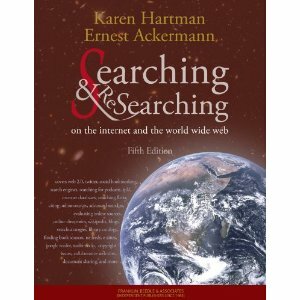 "Searching and Researching on the Internet and the World Wide Web, Fourth Edition" (ISBN 1-59028-036-9) by Karen Hartman and Ernest Ackermann, and published by Franklin, Beedle and Associates, Incorporated, Wilsonville OR, ©2004. Call 1-800-FBA-BOOK for more information. 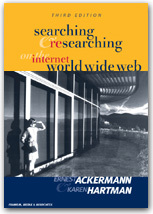 "Searching and Researching on the Internet & the World Wide Web. Third Edition" Ernest Ackermann & Karen Hartman. ISBN 1-887902-71-6. Published by Franklin, Beedle & Associates. Review, by Catherine A. Lee, Wesleyan College in The Journal of Library Services for Distance Education, Vol 1, No 2. Searching & Researching on the Internet and the World Wide Web Book Review by Dale Farris, President, Golden Triangle PC Club. Searching and Research on the World Wide Web, November 4, 1997, WebNet '97 (Association for the Advancement of Computing in Education), Toronto, Canada. Searching and Researching on the Internet and the World Wide Web. April 23, 1998. North Carolina Community College Computer Instructor Association. Researching on the Internet: Finding & Evaluating Information. Presented at Syllabus '99, July 28, 1999. Karen Hartman and Ernest Ackermann, "Finding Quality Information On the Internet: Tips and Guidelines," Syllabus 13.1(August 1999). You can't make good from evil, got to do the best you can. visits since April 9, 2001.